Germaines Luau guests are all welcomed with a traditional Hawaiian Shell Lei. The sounding of the conch shell announces the beginning of the evening’s festivities! Picture taking opportunities await as the Royal Court of Polynesia makes its entrance. As the imu (underground oven) is uncovered, the savory aroma of the Kalua Pua’a (roasted pig) – your main course of the evening – reminds us that dinner is soon to be served. Let us take you back 100 years & 27 miles from Waikiki to our exclusive beachfront property on the shores of West Oahu. Since 1976, over 3 million visitors to our Islands have become a part of the Germaine’s Ohana. Our all-you-can-eat buffet features an array of tasty Hawaiian – American selections, which include traditional Island favorites sure to please even the less adventurous. The night is filled with beauty, color, and excitement as our multi-talented kane (men) and wahine (women) take you through a non-stop, action-packed journey throughout the Islands. Take a musical journey with us as we bring the islands of Samoa, Tahiti, New Zealand, and Hawaii to life in our exciting Polynesian Review. From sunny shores of Pape’ete, are the graceful and dazzling Tahitian dancers with their colorful costumes and gravity defying headdresses. 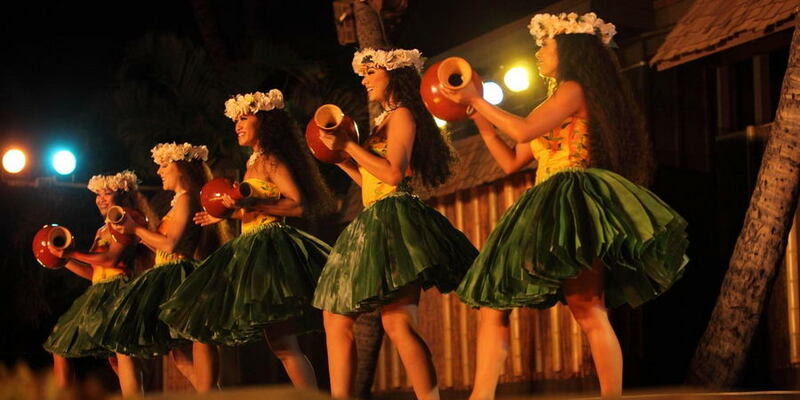 Tahitian dance is known for its swift and steady rhythmic hip movements. Incredible stamina and dance expertise are required to perform this high-energy rendition. 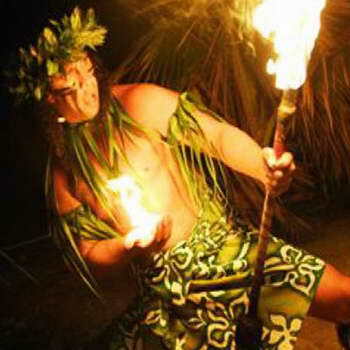 The highlight of the show is the Samoan Fire-knife dance, known as the “Tooth of Death”. In the original interpretation, this dance was performed with a dangerously sharp blade. The evening also includes unlimited soft drinks, coffee and tea as well as 3 beverage coupons for all adults 21 years and older.